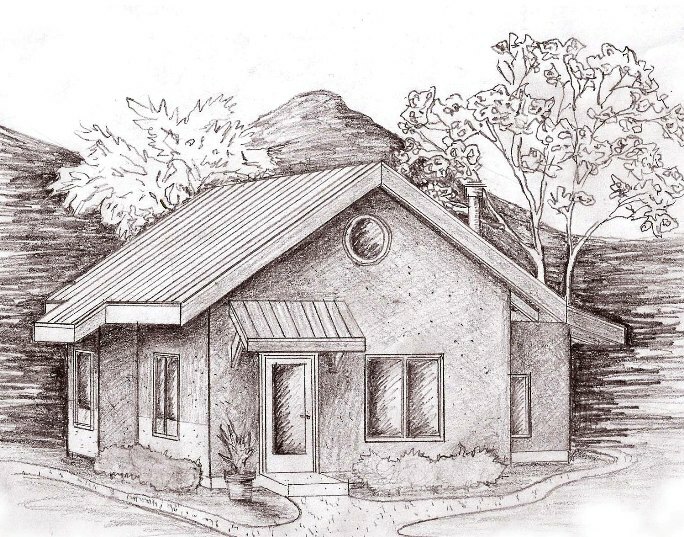 If you have ever wanted a gorgeous, yet affordable straw bale home, this is the design for you. 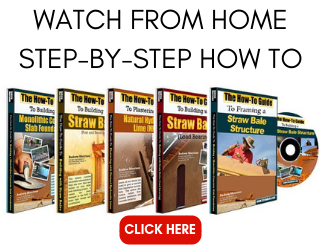 I work with people from all over the world who are looking to build their own dream straw bale home. One thing is always a concern: the cost. I know that times are tough for a lot of people these days when it comes to finances and building a home is a large undertaking to be sure. It doesn’t matter if you live in Australia, the United States, Canada, Europe, or anywhere else on the planet, housing is still a major part of the cost of being human. How to build a house for yourself that fits within a budget is always a challenge and one thing that ends up being lost very often in that process, is the architecture. After all, it’s cheap and easy to build a box. We really want to start putting this plan out there in the world because we believe it fills a real need for “human-scale” housing. There is so much in the way of large housing out there these days. You know the stuff, 2000sf, 3000sf and bigger. Some call them McMansions. Some even dare to call them Green construction because they use reclaimed kitchen cabinets or some other detail. The reality is that a home that size is simply full of wasted space in most cases, if not all. Do you really need a home that big? I doubt it. It’s true that I don’t know what’s best for you, but I can tell you that smaller spaces take less energy to live in, less time to clean, less cost to build, and less time/effort/money to maintain. Sounds pretty good to me. The affordable straw bale house shown above is roughly 770 sf. The main floor is 570 sf and the sleeping loft (one of two bedrooms) is 200 sf. You can check out the floor plans HERE and learn more about the design there if you want. Wouldn’t you love to have an attractive house with a simple and functional floor plan on your land while maintaining little or no mortgage to speak of? It often seems like we, at least here in the US, work harder and harder each year to make more money to pay for the details of our lives. The problem is, that the details of our lives get more expensive each year too. Why? There are lots of reasons, but building a house bigger than you need is a great place to start looking. Look at your money situation. Where do you spend the most money each month? Your mortgage/rent? Your food costs? Your car? Chances are that the single biggest expense you have is related to your house. And it’s not just the mortgage/rent payment. It’s the utility costs associated with the home. Take a look at the numbers and then consider what you can do to make a change. Consider building a smaller house that’s super efficient. An affordable straw bale home is just the answer you need for both initial construction costs and long term “life cycle” costs of the home. Chances are that will make a big difference on your wallet and, more importantly, the joy and free time you experience in your day to day life. Build Smart. Build Small(er). Build Efficient. Enjoy Life…every day! 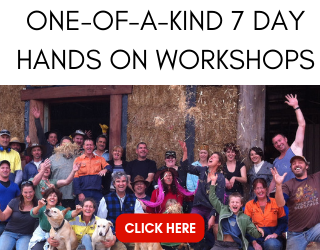 If you’re interested in really learning how to build with bales and you want to have perhaps one of the best weeks of your life in the process, then come to one of our workshops. We ALWAYS have a good time and you will gain the confidence to build your own house too. CLICK HERE to see what workshop locations and dates we have available this year! Have any homes been built with the Applegate plan? I’m intrigued and would love to see pictures of a finished build. Hi Caleb. There have been many builds with the plan but very few have been done exactly to plan. Most people make slight modifications to the plan to fit their needs while others make significant changes. I have had one person send me photos over the years. It is pretty similar in style, with some minor changes. We will be building a modified (only slightly) Applegate at the Washington workshop this year. I can’t attach photos here, but I’ll shoot you an email with the few that I have. I live in Northern Maine and the winters up here can get pretty cold (sometime -30’s but not often), are straw bales houses still okay to build in this weather? Also, who would I call to see if I can even build straw bale house where I live… I have a huge desire to build this house, but everyone keeps telling me its not gonna work. What are your thoughts and suggestions how to get my dream rolling in motion? Hi Jennifer. Yes, Maine is a great climate for straw bale construction and I know of several homes in the state already. There are a few homes listed here that you might want to contact to see if they have any feedback about building in Maine. In terms of whether you can do it or not, there is now a provision for straw bale construction in the 2015 IRC. The IRC is the building code used in all 50 states so unless Maine has specifically voted that section out of the code, you can reference it for your build. It’s likely that the 2015 version of the code has not yet been adopted as the adoption process is usually a couple years behind the approval of the new codes; however, you can certainly reference it with your building department to show the viability of building with straw. Let us know how it goes! Andrew, that’s not quite true–We live in Southern CO–codes predominantly in use are IRC 2006. I’ve talked with the planning/zoning engineer about including straw and adobe, but they are few and far between. I question whether or not the strawbale home I want to build would get a second glance. Any thoughts on how to sell these adequately, and to code? I am very interested in straw bale building, I live in Maine. Straw, from what I have read, seems to be harder to come by at reasonable prices in this area. 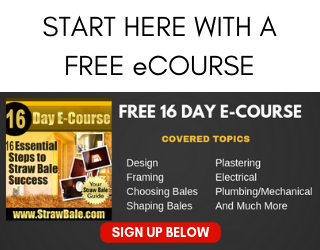 What is the difference between straw bales and hay bales? I have also done a lot of research as to the building process and have seen some people using plastic..wouldn’t this create an undesirable place for condensation issues? Seems to me that it would so I found that confusing. I did find a link above to find straw bale homes in Maine and I am thankful for that. One of them is about 20 minutes from here so I may hit them up for a visit and advice. Straw is the left over shaft of the plant stalk. The food source has all (ideally) been removed/harvested. The remaining plant dies in the field and is then cut, raked, and baled. Hay still has food value and is harvested while still alive. It is not a good option for building a house with for several reasons, not the least of which is that it is a food source for animals. I prefer the use of welded wire mesh on the surfaces of my walls. There are a couple articles on the blog that explain my reasoning. Condensation is not an issue as the plaster is in contact with the metal and pulls any excess moisture immediately off of the metal and dumps it to the exterior. Plastic can work as well if in the same plane of the wall; however, it is not as strong overall as the metal. Maryanne. You can find the plans for purchase here. They come with our DVD series as well. They are in imperial as opposed to metric, but that is not hard to translate. Is It possible build the house and later add an extension? Yes it is. It is always best to pre plan where that extension will connect so that you can make it as simple as possible later on. I prefer to actually frame a doorway opening into the existing wall, where I plan to extend through, and then run all my electrical up and over that frame. I bale the door frame into the wall, but by using the frame as a bale stop so that the bales inside the door are not connected to those outside of it. This way, when I later cut the wall open, I can remove the mesh from that area and kick out the bales. It’s like an instant doorway! We’re seriously interested in building a strawbale house in Virginia. Even though we are in a rural area, the building codes are fairly strict. I have made contact with the building official, and believe that they would be open to green building, but anything we did would probably have to be “engineer approved” to the hilt. I’m wondering if the plans on your site would eliminate the need to hire an engineer; meaning are they likely to satisfy the building officials on their own merit, or would we still have to provide someone to “prove” the validity of the building material/method? Where and when will the Washington workshop be happening? The Applegate is simply lovely! It will be on Whidbey Island, August 28-September 3. You can see all of the workshop dates and locations here. Hi Marty. Even though the plans on the site have been used to build and are very well detailed, some jurisdictions still require an engineer’s stamp. It would certainly make getting that stamp easier and less expensive. You might ask them directly what they would require. Let them know that you are considering purchasing plans that have been used before and see what they say. Good luck and let me know if I can be of help. If you need to get a state-certified engineer’s stamp (as we did because Kentucky isn’t using the 2015 IIRC yet), ask your inspector for a recommendation for a local architecture instructor or other recommendation. They may not give you a name, but if they do, you’ll get someone they’re already comfortable working with! And make sure your engineer calculates with 4×8 timbers (if they’re available in your area) rather than the 6×6’s that will require retying almost every bale! It’s real work, but oh so worth it!!! I saw a design that was a kind of circular living room that my wife REALLY liked but I didn’t recognize that plan on their website. Would love to know which plan that is. I’ll send you a photo via email to see if it was “this one”? If so, I can talk to the designer to see if he can make it available. If it is this one, there will be some necessary changes because this was part of a two family “zero lot line” home: meaning that two private homes were connected similar to a townhome (but slightly different). Hi Chris. Be sure to use STRAW, not HAY. That makes a huge difference. You do not need to spray the bales with any fire retardant as the density of the bales and the plaster coating is enough to protect them from flame spread. In fact, they have tested (ASTM testing standards) to three times the burn resistance of conventional construction, so no worries on that front! They will last a very long time, hundreds of years, if built properly. There are examples that are over 100 years old today and still occupied. Roughly how long does this house take to build? Will you be almost done with the structure at the end of the workshop on Whidbey? Do you have any hybrid building plans for a 4 bedroom 2 bathroom house thats made with Strawbale AND shipping containers? This is a fascinating read. I live in Los Angeles (CA) and I will soon be embarking on my first home build. Straw bale is definitely the route I want to take, but I like to mix the aesthetics of these clay homes with modern touches. Do you think this look can be a achieved with straw bale? Due to the size of my family, my home needs to be on the larger side (maybe 2500sqft?). Can you give a rough estimate on how much building a home of that size in this area would cost, just roughly? And how can I check to see if codes are in place for this type of construction? Hi Kent. Pricing is impossible to say from afar as I don’t know local material and labor costs. Sorry. Hi there I live in British Columbia (rainforest area) was wondering how much would cost to build that little house on the Sunshine Coast? Hi Robyn. Estimating costs is a difficult task made impossible without specifications and designs. In other words, any number I give you will be somewhat useless until you know what you are building and talk to local labor forces to get a sense of costs in your area. That said, I suspect you might be in the neighborhood of $150/SF for a contractor built straw bale home. Again, that is a VERY rough estimate based on typical numbers I see in the US. We currently live in Philadelphia, Pa; However, We are looking to relocate. What states can you build our dream home at an affordable rate. We would like to use locally sourced straw if possible to maintain cost and bring revenue to our new neighbors. Our home would need to be on a lot with at least .5 acres post production and have access to great schools and grocery shopping within 5 miles. Sorry for all the parameters, but I want to still smile well after the kids move out. Hi Robert. There is a national straw bale building code in place in the 2015 International Residential Code (IRC) so that is a great starting point. Look for states that are working with or will recognize the 2015 IRC. From there, it’s about land costs, material coasts, and labor costs. For example, building a SB home in the Bay Area of California may be 3-4 times as expensive as the SAME house built in Nebraska or Iowa. Hope that helps. I live in a straw bale home in Maine. I see some questions are being overlooked due to many questions in one comment. So here is what I have to say. I LOVE It. My straw bale is bigger, around 3000 +/- sq feet and on a mountain in western Maine. The insulation is so good that it only took 3 to 4 cords of wood to heat the entire house last year. Now when I say heat I don’t mean 65 degrees, I am talking 80 to 90 degrees to the point where we had to open doors to cool it down. Critters….. yes i have some mice and a squirrel had decided that the attic is a nice place to live. But I also have a “standard” house with blown insulation and it has just as many (we do live in Maine and critters try to stay warm in the winter). 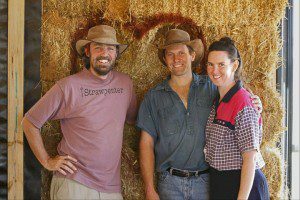 Difference between hay and straw? Hay molds straw doesn’t. My house is also very sound proof except for the windows. My husband layed on the horn in the driveway , I didn’t hear him (he wasn’t too mad at me for not responding lol). I hope this helps some people who are thinking about a straw bale home. I see the content about borax and formaldehyde containing alternatives. They say they are vented outside, and you are protected by sheetRock. But what if i put up a picture (aren’t I breaking that barrier? And door and window framing would allow in any vapors too, at least I would think so. I have already decided that my next home will be a straw bale home as well. It’s been a dream of mine to build a straw bale house. We are looking to purchase property in Joshua Tree. Is the desert a good place to build a straw bale house? Can straw bale be mixed with adobe to give it an adobe earthy aesthetic? Thank you! Absolutely. The desert is a perfect place for a straw bale house. You don’t need to mix the bales with adobe to get that earthy look. You will get that look with just the bales and plaster. If you want to add adobe for thermal mass on the interior (as a partition wall, Trombe wall, etc.) that is an option as well. My husband and I have been debating for a very long time into building a straw bale home and also a garage. The difficulty we have in choosing whether we should or not is we were told that because the straw is hollow and we live in Canada with it’s rigid winter we will need to insulate the wall anyway with a vapour, and frame the walls also if we want to put heavy ornaments on walls. Could you steer some light into this for us. It would be greatly appreciated. Hello. I have worked on many straw bale structures in Canada and they perform amazingly! No need for extra insulation, the bales are completely adequate (three times as well insulated as a conventional Canadian home). Hanging heavy items is no big deal at all. You can use masonry anchors or, for real heavy items like kitchen upper cabinets, you can install 2×4 backing behind the plaster. Those two pieces of information are entirely incorrect. We have built many bale structures in Canada and they are doing amazingly well. The hollow core of teh straw is actually why they perform so well. those areas trap air and that acts as insulation. A bale house is roughly threew times as insulated as a conventional home so whomever told you that you would need to insulate a bale house with conventional framing and insulation does not know what they’re talking about at all. Same is true for hanging items on the plastered walls. In most cases, you can hang with a simple anchor like in any wall where you are not attaching directly to the frame. It’s even stronger than a typical drywall assembly. In cases of extra heavy items like cabinets, it’s best to lay in some backing behind the structural mesh and in the plane of the bales. It’s not a whole wall frame though, just a floating 2×4 will do. There are details of this in the how to video we sell and we teach it in our hands-on workshops as well. The good news is that the person who tried to steer you away from bales did so because they don’t know anything about bales, not because they won’t work for you. Facinated by the concept of building a straw bale home here in Sevilla Spain. Temp can reach 45c in summer and -5c in winter, is straw a viable alternative for these conditions. Hi, is Rosarito beach Mexico a suitable place to build a straw bale house? It is 15 minutes from the border in Baja California. Hi would you mind sending me some pics of any builds that are closest to this design? I would like some photos of the inside if at all possible? Hi Erran. I am always looking for photos of this home once finished and I rarely get examples. I’ll see what I can find and perhaps do an article showing different versions of the home one day. Hi Kevin. Yes, straw bale homes work really well in climates with extreme conditions like this. They will keep you warm in the winter and cool in the summer! You might undoubtedly view your enthusiasm from the pictures you are. The earth desires even more passionate internet writers that may not be afraid to say what they believe. Always comply with your own heart. Hi Andrew, I was planning on building a 2 story post and beam from reclaimed barn beams. Would you know of any sites to help with pointers, should I look into buying plans? How does a person insulate the roof using earth products.? I would not recommend “earth” products like straw as they end up being too heavy and not worth the extra materials to support them. I prefer to use things like wool, cotton, or Roxul. They are natural and lightweight.